These swords are made as closely to the original processes as my skill will allow. I enjoy the opportunity afforded to me by my customers to forge and hilt up these sharp pieces which I hope reflect the weaponry of our ancestors. Anglo Saxon Sword late 6th/early 7th century. This sword was a specially commissioned piece, and is based on the find from grave XVI Alton, Hampshire Anglo Saxon cemetary. The blade is double edged and has a shallow fuller groove running centrally. The blade is pattern welded. It consists of a central section of 4 separated bundles which are alternately twisted in an interrupted twist pattern. The two central bundles are aligned with regards to their twisted/untwisted sections, whilest the two outer are alternate relative to the centre.The edges are welded on separately. The hilt is interesting in that it is not of the sandwich type of this period, or completely organic, but is a construction that relies considerably on the strength of the two wide ferrules to keep it together. Aside from the iron plate of the hilt nearest the blade, there are no more in its construction. There is no evidence of rivets. The pommel is an elongated pyramid of bronze, the tang passes through this and is peened. 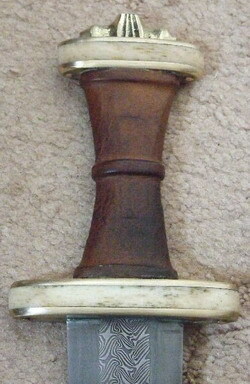 The hilt is composed of horn plates for the cross and upper guard, and thick walled antler for the grip. These materials are an interpretation, based on the superior strength of horn when unsupported by metal plates, and antlers better crack resisting properties when compared to bone. Overall a good example of a down to earth sword, not a rich property with no precious metals being used but instead very well constructed and functional. 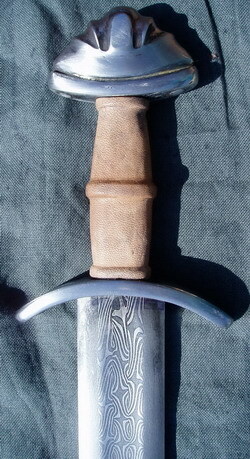 Noteably, despite the small length of the grip, a very comfortable sword to hold, the flaring of the ferrules adding considerably to the ergonomics of the hilt. This is a Petersen type "L" sword with a pattern welded Geibigs type 1 blade (wide, flat and minimally tapered). It has a three cored continuous twisted core with carbon steel cutting edges hammer welded on. The blade is typical of a 6th century blade. 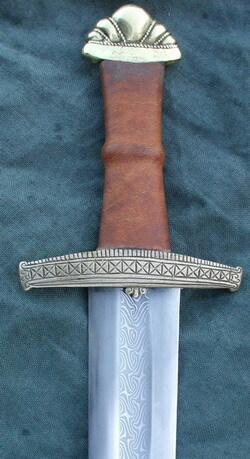 It has been hilted with a 9th century type "L" pattern hilt. Such swords are often re-hilted as a way of keeping an heirloom sword "alive" to be handed down to later generations of the same family. This was particularly the case when swords were hilted entirely with organic fittings. This is a mid 7th century Anglo Saxon pattern welded blade. The core is composed of three bundles of alternating wrought iron and carbon steel layers and each bundle is composed of twenty two layers. The bundles are hammerwelded to form a rod which is then twisted but only for short sections, leaving a section of straight, untwisted rod interspaced between each. These rods are then placed together and hammerwelded such that the straight and twisted sections coincide with each other across the cores width. This was a very typical pattern for the period. It is somewhat challenging in that time is needed to ensure the twisted section brings the rod around such that the edge layered side of the rod is always exposed to the blades face. The three rods then need to be placed such that the twisted and untwisted sections coincide neatly and symmetrically before the core is welded. The edge steel is a traditional straight high carbon type. This is a early 16th century German sword. It has a wrought iron blade and a holly wood hilt. The blade is an original from Solingen - date unknown. Such a sword would have been used as a secondary weapon for close combat. This is an 18th century American revolutionary period sword. It is a crudely made weapon that would have been made by local blacksmiths. The blade is mainly wrought iron with a thin steel layer in the middle to provide a cutting edge. It has a stirrup hilt with a scale handle made from elm. 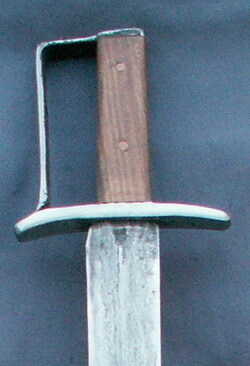 A pattern welded sword from the tenth century with a T-cosy pommel and a short iron crossguard. The blade is a slightly tapered pattern welded blade of the Gebigs type 3 with a two twist core. 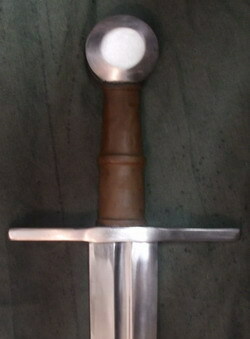 The hilt is an interpretation which features a waisted grip common on many earlier swords of the Germanic tradition. This grip shape takes the heel of the hand away from the edges of the T cosy pommel and prevents the edges from digging into the hand. The grip and handle shapes are an enigma for many early period swords. The organic components of surviving swords almost always rot away leaving an empty iron tang, which gives very little clue as to what was originally there. Sometimes ferrules or wire mouldings survive, giving an indication of what existed but this very rare. An early 6th century sword. The blade is a continuous three twist pattern welded core with carbon steel edges. The hilt is much like the Cumberland hilt composed of organic elements for the cross guard, grip and pommel. The tang button is a small bronze pyramid which keeps it all together. 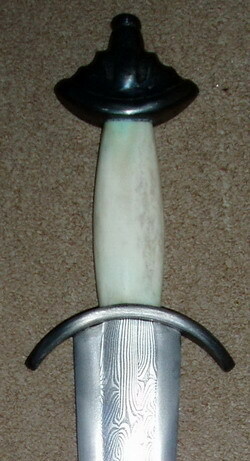 A Petersen type "L" sword based on finds from the Isle of Man. This sword was made for the Manx Museum's interpretive display of the 'Viking and Early Medieval Heritage of Man' exhibition. 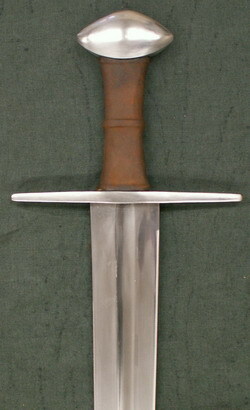 This is a higher status sword with a plain iron hilt and a goatskin covered grip. The blade is a continous three core twist with a steel edge wrap based on the Geibigs Type 3 blade. This is a low status sword from the 10th century. The hilt is composed of two straight iron bars with an antler grip. The blade has a core of layered iron with carbon steel edges. 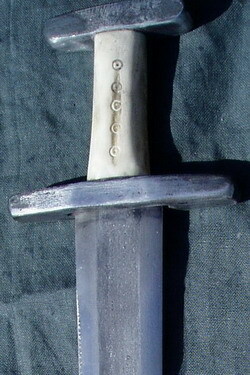 An example of a sword of the Viking era which is not pattern welded. An early 13th century sword with a disc pommel and a straight crossguard. The ash grip is wrapped with vegetable tanned goatskin and the blade is made from plain carbon steel. 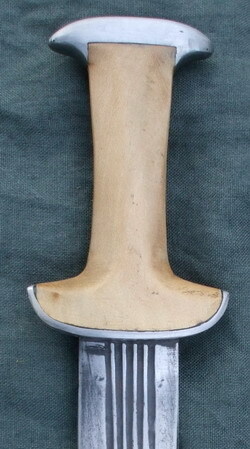 A 12th century sword with a brazilnut pommel. It has a steel blade and an iron crossguard with a goatskin covered ashwood grip. A 6th century migration era pattern welded sword. The blade is a three bundled continuous twist core with carbon steel edges and the blade profile is a Geibigs type 1. The hilt is made with bone and bronze plates and the leather covered ash wood grip is of a waisted design. The sword has a bronze pommel cap featuring two stylized beasts heads back to back. The blade profile is a Geibigs type 1. An early 16th century Moravian/Bohemian Dussage (Tesak). It is a peasant weapon consisting of a forged blade with the iron wrapped round to form a knuckleguard and it was an easy to manufacture and functional weapon. I have forged the hilt in wrought iron and hammerwelded on a piled/layered blade with a long splice weld. The blade has a coarse layering of eighty folds of two different carbon steels to try to replicate something of the piled structure inherant in some of these historical blades. Folding the billet several times serves to refine the steels structure and average out impurities which makes a stronger blade. This is a copy of a sword found localy to me in the moat of a motte and bailey castle in the village of Mileham in mid Norfolk. Stylisticly it is early English with Acanthus leaf vine foliage one side of the guard and a geometric X design on the other. The small five lobed pommel has beaded trimming between the lobes and upper guard and pommel cap. This sword is unusual in that the fittings are cast in bronze. This sword is one of the few known sets of sword fittings to be manufactured using that technique during the period. This is a late Romano British sword blade. It is of the "streaky" type which refers to the piled iron and steel of its core construction. This gives rise to the laminations which you can see as streaks in the blades centre. The edges are steel which would have been folded a great many more times than the core thus giving a much more homogenous surface effect. 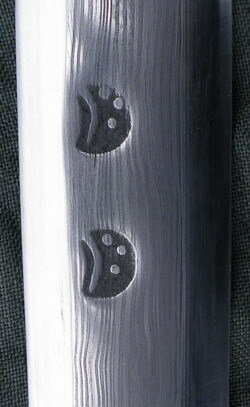 The blade is stamped twice with the same stamp - a three quarter stylised moon.